After a long history of dieting or restrictive eating it can warp your mind into thinking you can’t or shouldn’t eat certain foods. As each new diet hits the market another macronutrient is attacked and eliminated. It was fat in the 90’s, carbohydrates in early 00’s, gluten in the mid 00’s, grains and fruits in the late 00’s and the newest is the poison of sugar. Attempting to eliminate food or macronutrients from your diet will only result in shame or guilt. Shame and guilt is directly associated with the feeling of restriction and deprivation leading to binging. It’s important to understand that all foods can fit into your diet everyday. In fact, the body requires all nutrients in order to work most efficiently and effectively. Take for instance carbohydrates…did you know that brain needs at least 150 grams of carbohydrate per day for brain function? Um, yup…that’s why you get cranky when you haven’t had any! So, how do you feel in control again and start over. It all starts with giving yourself unconditional permission to eat all foods. Everytime those thoughts of guilt for eating a food you enjoy creep in, remind yourself it’s okay to eat it and enjoy it. Remember, all foods can fit! 1. Make a post-it or sign giving yourself permission to eat. Put it on the fridge, the pantry, on your computer, and/or the table. 2. 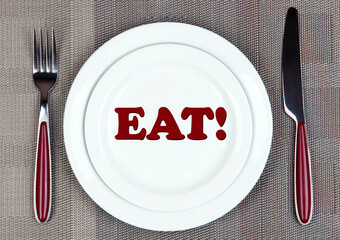 Say it over and over to yourself every meal and snack you eat! Yes, over and over. You have been telling yourself for so long that you can’t eat those foods, you will need to counterbalance all the restrictive talk! You CAN eat it! It’s will take daily practice. Remember, you are an adult and no one should shame you about what or how much you eat. Only you can decide that! Can you remember a time your weren’t on a diet? Have you always struggled with feeling good about your eating? Are you sick of dieting and you are ready to start improving your relationship with food? Over the next 30 days the FREE eCourse you walk you through beginning to improve your relationship with food by getting daily emails with information, infographics, videos and motivation. Do it at your own pace and on your schedule.